(Newser) – A Czech Republic court has struck a blow for religious freedom—ridiculous, ridiculous religious freedom. 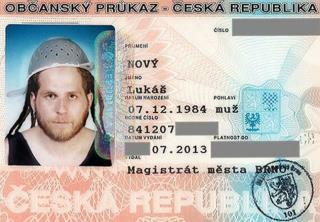 Lukás Novy, 29, successfully argued that he should be allowed to wear a pasta strainer on his head in his official, government-issued ID photo, because he was required to do so by his "Pastafarian" faith, the Daily Mail reports. Novy belongs to the Church of the Flying Spaghetti Monster, a parody religion whose followers "believe" that a giant invisible monstrosity made of spaghetti and meatballs created the universe after "drinking heavily." "Intelligent Design" is the name of the re-branded creationist nonsense, not "Intelligence Design". It's called a Colander and it's the first Yarmulke that lets dandruff out. I do not want to know what he does with other kitchen gadgets.